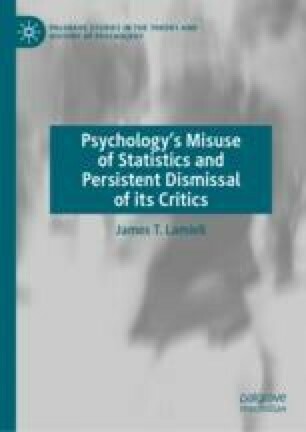 This chapter discusses the manifest incorrigibility of mainstream scientific psychology in the face of trenchant critiques of the long-standing practice of interpreting statistical research findings defined only for aggregates of subjects as if those findings warranted claims to scientific knowledge of individuals within the aggregates. It is argued that the untoward consequences of this practice, which are both epistemic and socio-ethical in nature, have historically been concealed by the custom of speaking and writing about aggregate statistical research findings in ways that conflate the distinction between frequentist and subjectivist understandings of probability. Mainstream psychology’s refusal to come to terms with this essentially conceptual problem is discussed in the light of a warning issued by Wilhelm Wundt more than a century ago that a psychology unmindful of the crucial role of conceptual inquiry in all of science would in time imperil its own existence.